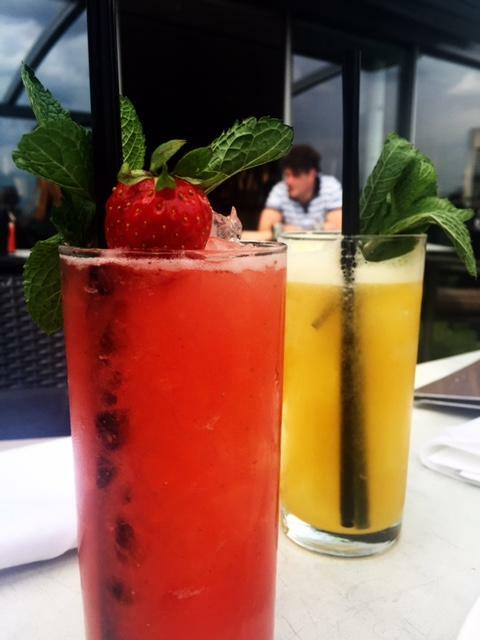 The Radio Rooftop Bar is best described as ‘summer in the sky.’ Rooftop bars always emerge in the summer; they sprout up on any flat surface, 20ft or higher above the ground, which will have them and vary in offering, style, and success. 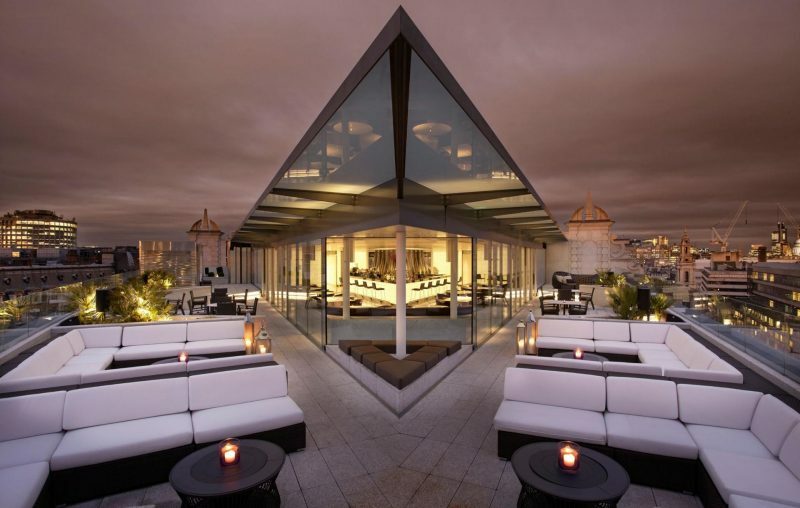 Not the Radio Rooftop Bar – a year round taste of fun, jazziness, and beautiful views is served up at the top of London’s ME hotel along with an eclectic tapas menu that I’ve never really got round to fully sampling because I get stuck reordering their addictive croquettes on loop. This month, the cycle of addiction was broken, when I was given something new to obsess over at Radio, in the form of their relaunched summer brunch menu and two words which accompanied it: bacon dust. Yes, one of their plates actually comes sprinkled with bacon dust; talk about a tease. We arrived early, at midday, a time of day in which I’ve never really visited the bar and it was all round much emptier and brighter. I made a mental note to commend my less sober self however for the pretty accurate judgement from late-night visits past, of how sweeping and stunning the skyline views of the city are, even when not lit up, and even if more telling of London’s truly industrial nature. Early birds catch the worm, or in our case, the best view and we sat back, immaculate iced-coffees in hand to take in the view for a few seconds before doing the customary thing anyone in 2016 London would and putting each others company on pause for a good 15 minutes whilst we took photos and videos. I received my first snap chat tutorial, and I still do not understand it. We spent, unexaggerated, the next 25 minutes trying to narrow down our choice of dishes from the menu to a list acceptable for a.) consumption by less than a party of 5, and b.) to order out loud with a straight face. We tactically decided the savoury dishes could count as our ‘starters and mains’, and anything of a more syrupy variety fell into the dessert category, and everybody knows dessert doesn’t even count. In addition to classics such as ‘huevos benedictos’ (fancy eggs benedict) with potato (mexican style) and truffled hollandaise, or their famous crab omelette with chilli and coriander are new dishes with an indulgent twist on brunch time classics. 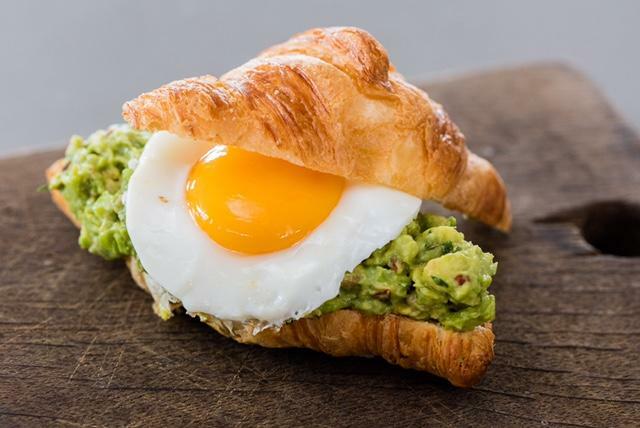 We ordered the poached eggs laid out on a split open croissant spread with superfood of the Gods, avocado of course, and sprinkled with chilli, lime and coriander. 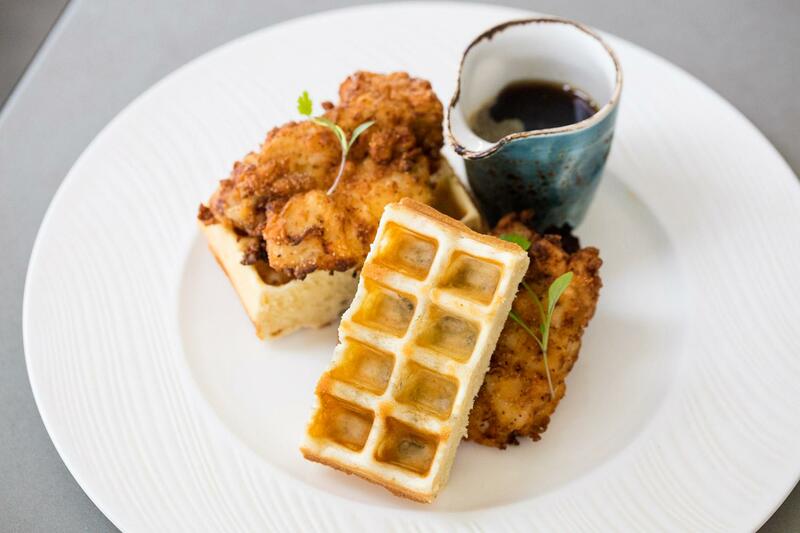 Another addition to the brunch menu is the buttermilk chicken with waffles and maple syrup which we firmly concluded during our operation order less than 20 dishes, was a ‘savoury’ dish despite the maple and waffle factor. We’ve documented the moment we drizzled the maple syrup over the fluffy, golden, just crisp enough waffles and onto the equally golden fried chicken because this is no ordinary cheat food: the food is so lightly baked, lightly fried, and in-excessive that we completely forgave it of our anti-summer-health-kick sins, before proceeding onto our final savoury dish from the ‘starters and mains’ section of our dedicated afternoon of eating. We finished off with the shakshuka; a middle eastern and Moroccan take on eggs; one fried egg atop a bed of rich, tangy and spiced tomato and pepper salsa, accompanied by sourdough bread. With a little siesta in between to digest and prepare (and apologise to) our stomachs for what lay ahead, we finished off with the Ricotta Pancakes with Banana and Honeycomb butter, as well as the French Toast with Mixed Berries. A divine, sweet but balanced, light set of plates, we were stuffed, yes, but feeling relatively guilt-free for the feast we had just indulged. We had eaten until we had to give in: you win, Radio, you win. We had spent about 20 minutes photographing everything from the views, to our plates, to the burst of colour from their fruit-based signature cocktails, for every 30 we spent eating. We were there for nigh on four hours. We refused to leave, but knew, eventually, we had to. Looking around, I saw the buzz around us was as energetic and enigmatic as the cool, laid-back, effortless vibe the Radio Rooftop bar embodies by night: the DJ set was already ablaze and gradually getting louder, and groups of girls on catch-ups, romantic dates with the fella looking quite pleased with his choice of venue, and even families had arrived to fill up the buzz on this perfect sunny day. Who needs beach clubs on a summer London day, when you have this? Not the ME hotel, when it’s got Radio Rooftop up in its nest, thats for sure. 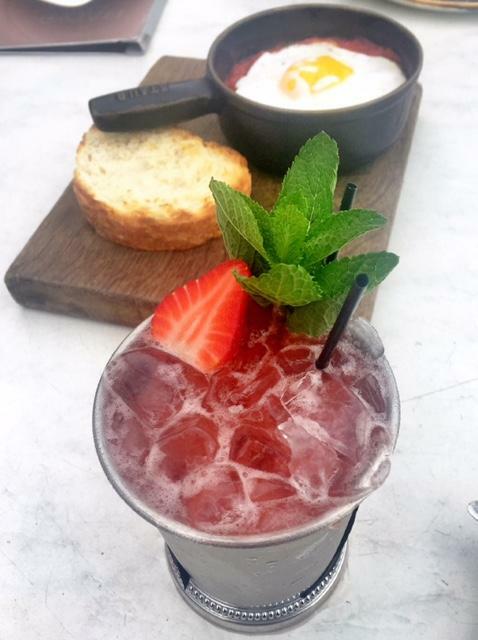 Radio Rooftop Bar is open from 11am – late Sun-Weds, and 11am – 2am Thurs to Sat. 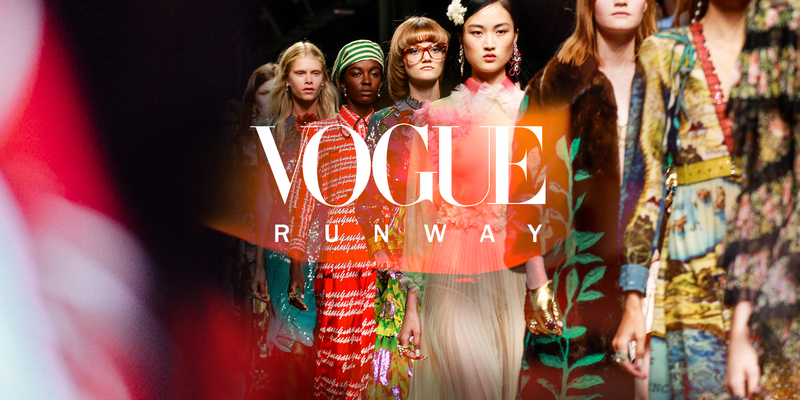 Reservations can be made via: London_reservations@togrp.com or +44(0)207 395 3440. This rooftop restaurant looks heavenly, wowww! What a nice place to have breakfast. A Succulent description of the mouth watering menu! Combination of the dishes also looks great. The roof top view is amazing but what ,In case of rain? Everything looks delectable! I’ve always love breakfast meals. This is such a nice place. This rooftop bar looks like a very nice place to hangout. Good food with amazing views. 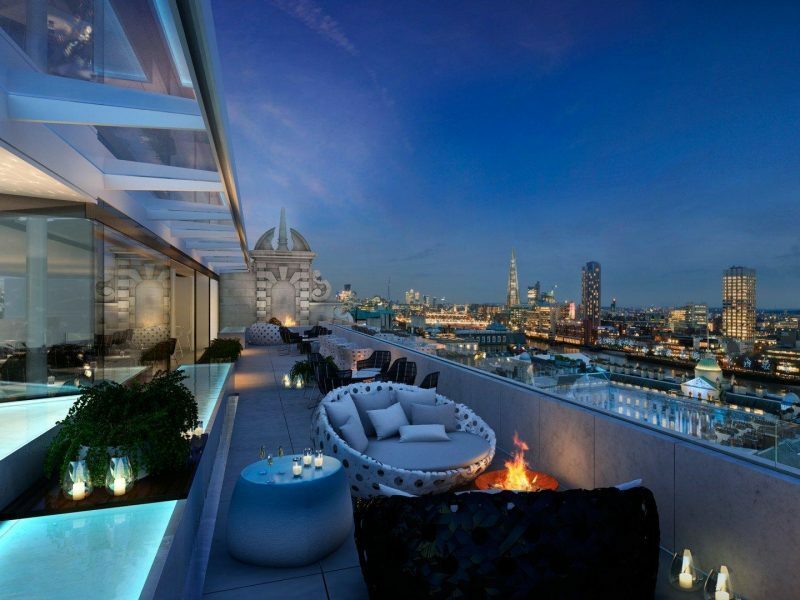 A Roof Bar is perfect if you’re looking for something elegant and comfortable to chill. I love that delicious food can be eaten at the same time as staring at the sky. So chic! Rooftop restaurants and bars are the best place to dine in the summer. Thank you for the review! Yes, rooftop restaurants are the place to go for a fun dining in the summer. Tis the season! This looks so great for brunch with family or loved ones. The views are spectacular. The review of the venue is nicely done. While I enjoy reading, I love the photos that come along with posts like this. If there is a reason for me to visit this place, it would be because of the photo of the French Toast with Mixed Berries. Good job with the cam! I, too, love the French Toast with Mixed Berries. It literally made me hungry every time I look at it. That skyline view that and those choices of food. What more can you ask. Radio Rooftop Bar is a place where I always wish I could be. Thanks for featuring this place. Hello! One question is your base in London? I know it’s a place with constant rain, how can you handle this? I think this a great idea but for places with no rain almost like latin america or at least less rain. Love the menu though! Summer eh? In the second picture, it looks like it was about to rain. If there is anything in this particular post that had gotten my attention, it is two words – “bacon” and “dust”. I had bacon, bacon slices, and bacon bits. As if the thing is not already appealing as it is, they found a way to turn it into dust?! I am a bit concerned of whether or not it is real bacon meat, cooked, dried, and pulverized or simply just bacon-flavored powder. buttermilk chicken – you cannot be on diet when you visit here. But rooftops and this sort of view always win in my book. OMG! I totally agree with the croquettes being so addictive! They’re a personal favorite. Love your post, by the way. You’ve got some nice shots there and I think I’d love to try the buttermilk chicken with waffles and maple syrup when I get the chance. Hmmm that poached eggs laid out on a split open croissant looks delicious! And like you, I LOVE avocado too, but I never thought to try it on an egg sandwich. Yummy! This is a very informative blog! I haven’t eaten this French Toast with Mixed Berries and it looks very delicious! Thank you for this post! The view looks very nice and the food looks mouth-watering. 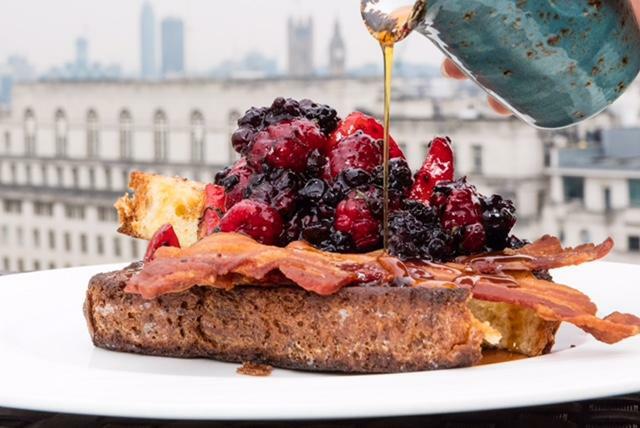 I want to try this French toast with bacon and berries on top. Is it cinnamon syrup or just maple syrup? 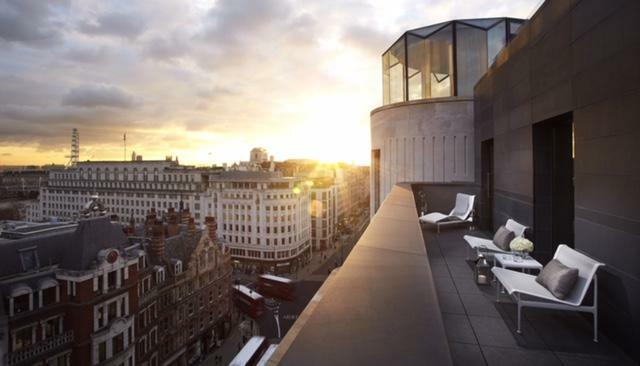 I heard about this rooftop bar before which located at the 10th floor of ME Hotel in London. Is it true that there is a dress code to enter the bar? Jeans are not allowed? Not much of a brunch person but that place looks like it is worth a visit. The reviewer did a splendid job on the photographs. Rather enticing. Gonna visit a friend’s flat near that area soon. Looks like I will get to review the place myself. I will likely be having everything this reviewer ate during their visit. Everything in the pictures look absolutely heavenly. I’d probably lose my appetite for lunch after that, but who cares? I gotta try everything they have on the menu! I have never been on a rooftop restaurant before and this one looks so lovely. It would be very nice to have breakfast, while looking at the blue sky. Your photos are giving me serious food envy! 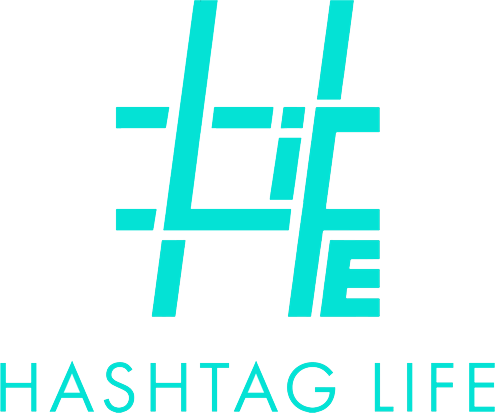 I seriously SERIOUSLY wanna check this place out. Like right now! What a perfect brunch place! I’m dragging my roomie out of bed and taking her here if I have to carry her over my shoulder! Seeing the photo of the rooftop: wow! And also the breakfast… it looks perfect place to enjoy London in the morning. This place look really great and the food look delectable. I love the way you write. 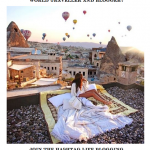 Reading your articles, it seems like you really love what you do for a living. AND I ENVY YOU A LOT!